Holy Moly! The proverbial tunnel! I am not sure how I explained this in the audio, but here goes… today, Chiron, the Wounded Healer, moves from Pisces to Aries. Saturn begins its yearly retrograde as well. 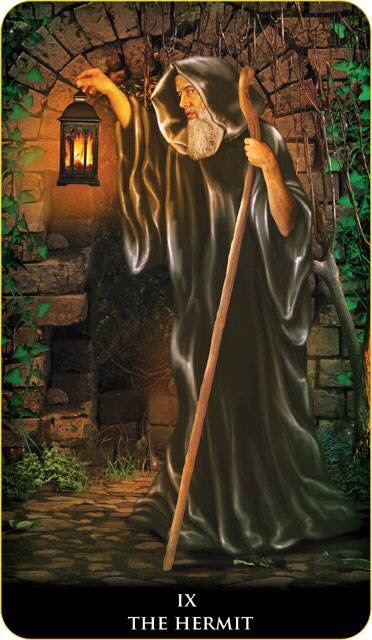 We have some form of new beginnings going on here, perhaps not totally clear yet, but the Hermit is here to be our guide. Today may very well be that emergence from that very long tunnel which went back for years. This new labyrinth which is appearing is not very menacing, and the light here shines brighter. When one comes out of a very long cycle it is a good idea to look around; you may even be questioning how it is that you arrived at this place. Take a little time out today for some quiet introspection to consider what this next part of your journey may hold. As much as we would all like to think that we have both, control over outcomes, and the free will to make them happen, there is so much more to it. The Hermit is that wise counsel, showing us the way we need to take, even if it is not where we intended. This entry was posted in Card of the Day, General Tarot, Patreon, Readings, YouTube Videos and tagged Card of the Day, Guidance, Hermit, Path, Reading, Tarot.